Last weekend I traveled with my family from Shanghai (where we live) to Ningbo 宁波, a smaller city located a few hours south of our city not far from the Zhejiang provincial coastline and the islands of Zhoushan 舟山 and Putuoshan 普陀山. Like Shanghai, Ningbo shares the heritage of being one of the first five Chinese treaty ports following the end of the first Opium War in 1842. 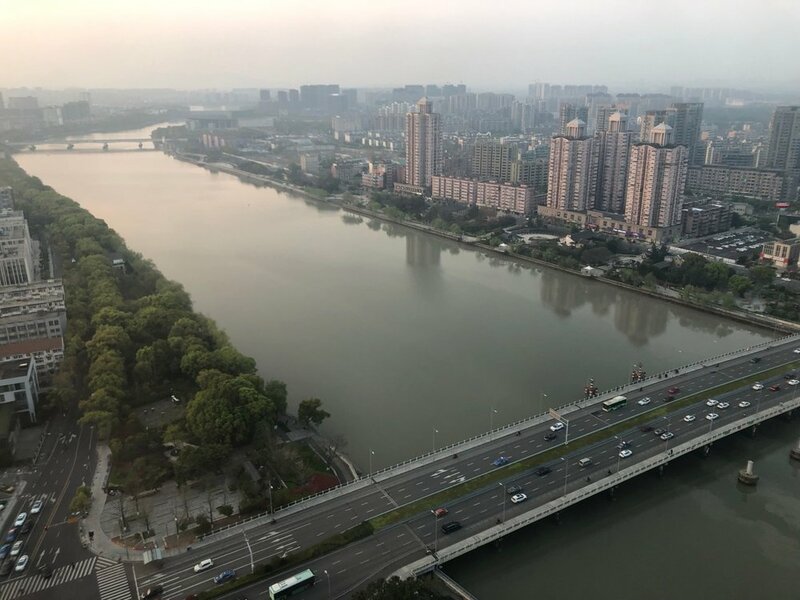 I have been to Ningbo many times, but usually for short visits with a specific purpose, and I hadn’t had time before to tour the city and its environs. This time we had two days to relax and sightsee while my daughter Sarah was in a debate competition held at a local school there. During those two days, we visited four popular tourist sites: the famed library known as Tianyige 天一阁, a Zen Buddhist temple called Tiantong 天童禅寺 (“Heaven’s Children”), the Ningbo Museum, and the Nantang Food Street 南塘老街. We stayed at the Marriott located where the rivers meet in the middle of the city, and took in the beautiful views of the city from the 30th floor. All in all we came out of the trip with a very positive impression of this city and its rich cultural heritage. The trip from Shanghai to Ningbo takes a few hours. 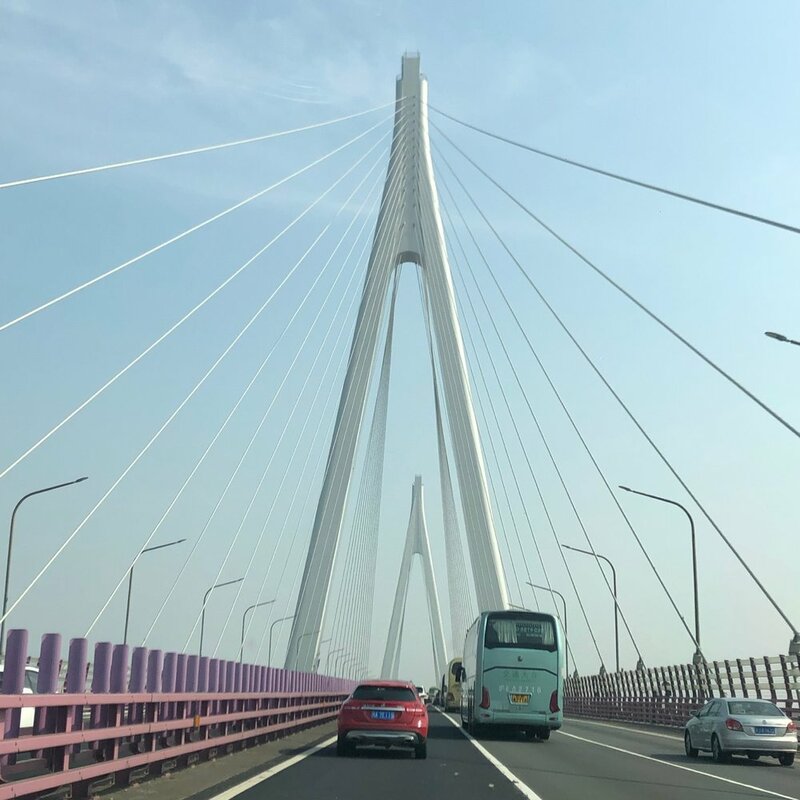 The train is very convenient, but we chose to drive, and so we drove across the Hangzhou Bay Bridge, which affords a view of the bay, surprisingly empty and bereft of ships as you pass along the 35-km long bridge. The first item on our tour agenda was to see the legendary private library known as Tianyige, named after a hexagram in the Yi Ching (Yi Jing) or Book of Changes. This library was set up originally by a Ming jinshi 进士degree holder and noted scholar-official named Fan Qin 范钦. Since then, it has undergone many trials and tribulations and its collection has been decimated more than once—notably during the Taiping Rebellion of the mid-19th century—yet it has remained one of the most cherished, well-known, and important private libraries in East Asia. It is constructed in the style of a Ming dynasty garden (think of the gardens of Suzhou) with ponds, rockeries, and various courtyards, buildings, and passages connecting the complex together. It still stores and holds thousands of rare volumes dating back to the late imperial age. One must keep in mind that the Ming dynasty (1368-1644) witnessed an explosion of printed volumes as commercial print culture flourished in China, and through the exhibitions in the complex you can learn about how books were printed and distributed back then. Despite being located in the middle of the city just a few kilometers from where we were staying at the Marriott, it is a tranquil place as long as you don’t mind scads of other tourists, and it is well-built for contemplation and study. Next, we drove to the outskirts of the city passing by farms and fields full of the yellow rapeseed plants, and took a mountain road into the low green mountains surrounding Ningbo, until we reached the site of the Tiantong Zen Temple, located roughly an hour’s ride outside of the city center. From the parking lot, we took a vehicle up the road to the temple’s entrance. The temple itself is built in stages and levels that go up the mountainside, as are most temples in China built in the mountains. We walked all the way to the top of the temple grounds and back, passing by Chinese Buddhist monks and plenty of other tourists along the way. From inside the main temple we heard chanting, but weren’t able to see the rituals. Once again, we were enfolded in a pervasive atmosphere of tranquility and calm repose, notwithstanding the thousands of others who flocked to this well-known tourist site. This was also a perfect season to visit the temple, as cherries and other flowering trees were in full bloom, radiant on the mountainside. The following day, we visited the Ningbo Museum. 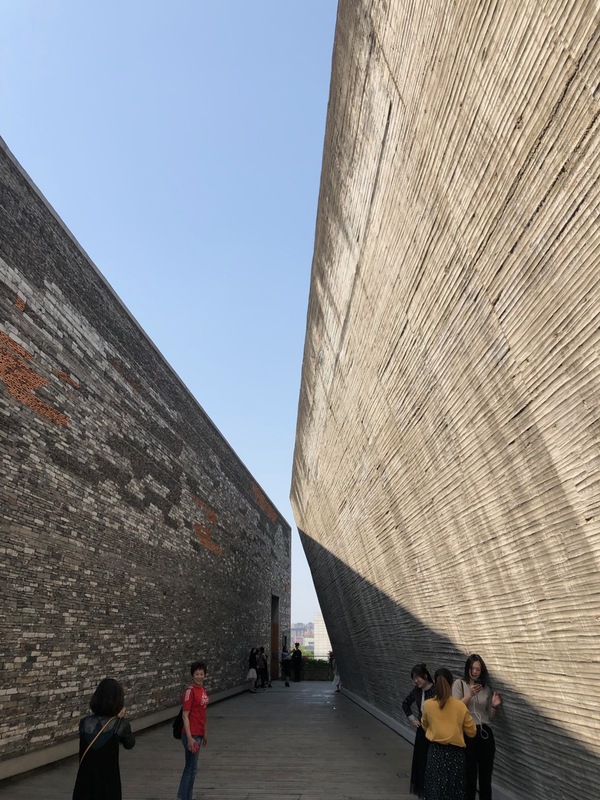 People note that the most impressive thing about the museum is the building itself, which is indeed well-designed with old bricks and tiles yet with a strikingly modern feel to it, especially when you walk around on the top of the building. I was impressed with the exhibition of Ningbo’s cultural and economic history, not so much for the collection of actual material artifacts as with the overall presentation, which included plenty of maps, diagrams, models, and illustrations of Ningbo’s development as a port of trade since ancient times. I hadn’t realized how deeply connected the city was to the trade with Japan, going back to medieval times, nor was I aware that the city was originally known as Mingzhou 明州, and that the first Ming emperor Zhu Yuanzhang 朱元璋 was recommended to change its name so as not to use the same character as the dynasty. So the town became Ningbo, “tranquil waves”, which resonated with the county name of Dinghai 定海 “calm seas”. This happened in the year 1381 according to a panel in the museum. Finally, before picking up our daughter after the end of her debate competition, we visited the Nantang Food Street 南塘老街 also located in the middle of the city. There we tasted some local treats including the chou dofu 臭豆腐 (stinky tofu) and brought back plenty of snacks such as niangao 年糕 (pounded rice cakes) as gifts for the in-laws. This follows a Chinese custom: always bring local foods back to your loved ones or to give as gifts to friends and colleagues. Our overall impression was of a city steeped in a rich cultural and economic history, lively and modern, but not nearly as crowded, international, and built-up as Shanghai. With nearly 7 million people in all, this is still a sizable city by any standards, but it lives up to its name. Walking along the rivers that meet in the middle of the city, or strolling through gardens, libraries, temples, and museums, one can bask in a feeling of tranquility whether in the city center or along the lively food streets. Such is the nature of a city whose prominence as a trading port was completely overshadowed by the monstrous growth of its northern treaty port neighbor, Shanghai.